As of Sunday, March 30, my woodlands garden now has three peach trees, two pomegranates, countless strawberries in bloom, 19 blueberry plants, the tenuous beginning of a rubarb and asparagus plant, four blackberry plants, numerous perennial flowers and one unidentified fern. (Note: my woodlands garden wasthe source of inspiration for nonprofit Loving Garland Green's beginning) All are thriving on about one-third of land that was once my front lawn. 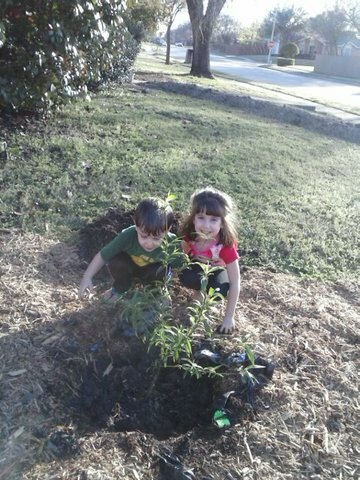 Erin and Jack helped me to plant the third peach tree. Children are great and enthusiastic gardeners. Unlike some adults, they demonstrate the utmost of patience and persistence when engaged in gardening activities. Perhaps they realize the importance of the task at hand and its relevance to the future. I don't know. For those new to the urban gardening scene,a woodlands garden (sometimes called 'forest gardening') is the oldest form of land use and one of the most resilient agroecosystems. Forest gardening is a low maintenance, sustainable,plant-based food production system based on woodland ecosystems that incorporates food and nut trees, shrubs, herbs, vines and perennial vegetables. Using companion planting, these plants can be intermixed to build a woodland habitat. The book providing the source of inspiration for me is titled "Paradise Lot". It is the story of how two friends living in a home on 1/10th of an acre in Holyoke, Mass. transformed their back yard into a woodlands garden. Now they teach classses on how to do it. Paradise Lot. Today, the Internet abounds in information regarding woodlands gardens. The parks departments of many cities all over the USA are establishing woodland gardens. We at Loving Garland Green hope to establish one in the space we have been provided at 4022 Naaman School Road here in Garland. Sometime this week, as the representative for Loving Garland Green, I will be signing our official 8-page plus exhiibits agreement with the City of Garland. This agreement provides Loving Garland Green the license to be stewards for the administration of a community garden, the area of which is defined in this agreement. The area is about a quarter of an acre within the larger area of space at 4022 Naaman School Road. We had hoped for more, but will gratefully accept what has been allocated to us by city employees of the parks department. After all, look at what the two friends did with 1/10 of an acre they called Paradise Lot. We will take heart from their example. The big disappointment for me is that we will not have access to the bamboo groove there. I had hoped that we could clear out paths within that area where people could enter the groove and walk about. Walking and even sitting within a bamboo forest is a tranquil and calming experience. The only experience i have found to be comparable is being in the depths of a birch forest in Denmark. As it is, without permission to clear walking paths within the groove since it falls outside the licensed area for our stewardship, we do not recommend for people to seek this experience there as you could trip and fall, or get your eyeballs scratched with the sharp leaves. More details on bed installations at the community garden to come. Our Last Yard Sale for a While Was a Huge Success. We raised $501.35. Members of Loving Garland Green met many nice people. Our yard sales are laid-back affairs where we visit with one another, chat about our gardens and meet a lot of nice people who come to buy the treasures we have gathered. Among the many nice people I met was Anna who lives in south Garland. Anna is a young mother who is interested in starting a garden but who was discouraged with the results she got last year. 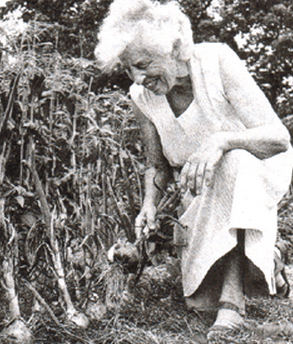 Like many inexperienced gardeners, Anna planted in unamended soil. She was very encouraged to hear the news of amended soil and raised beds. I sent her information regarding our "Another Urban Garden" program. This was our third yard sale and now we are giving it a rest for a while. Perhaps we will have another one around the Fourth of July or perhaps a little earlier on the Summer Solstice since it is June 21 and falls on a Saturday this year. That might be fun--a Midsummer's Night celebration. Margie's garden would be the perfect place. We wouldn't even have to bring snacks. We could just munch on all the vegetable in Margie's garden or perhaps we can walk down to the community garden, only a block away, and dance in the light of the waning crescent moon. If you want to learn more about the programs we offer: such as participation in the community garden; Another Urban Garden; and Micro Villages; we have recently created three brochures describing Another Urban Garden and Micro Villages. 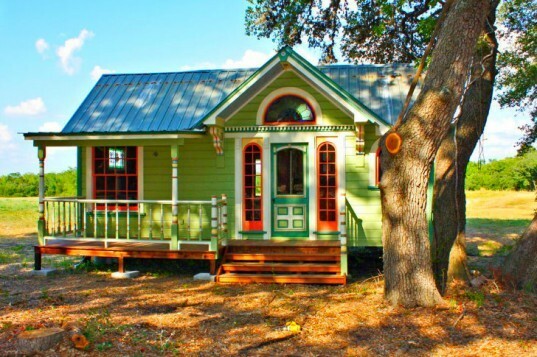 Plans are in the making to get together enough folks from Garland and the surrounding DFW area to Luling, Texas where Brad Kittel's Tiny Texas Houses manufacturing site is located. Judging from the the description of Mr. Kittel's operations at this website, his tours are quite extensive and educational. If this sounds like a tour you might be interested in, please respond on Loving Garland Green's website. Perhaps if there is not eough interest to warrant renting a bus, we can go in a caravan. Loving Garland Green, as part of our "Another Urban Garden" program, have installed two urban gardens for Garland residents and have three more on our schedule for installation. We are hoping to obtain funding from the City of Garland's Neighborhood Vitality program to support this program for Garland residents. If we obtain that funding, we may be able to create a few jobs by contracting out some of the work for the builds of the raised beds. As we are the living example: urban gardens help to grow and heal local economies by creating new markets and boosting existing ones. One of many examples of how motivated the residents of Garland are to grow their own food is evidenced by Eric who lives in South Garland. Eric attended one of our meetings two weeks ago. At the meeting I loaned him my copy of "Square Foot Gardening". Below you can see two photos illustrating the fact that Eric took the words of Mel Bartholomew, author of this book, to heart. In less than two weeks time Eric built a square foot garden in his backyard. Instead of wood strips, Eric used string to mark the foot squares of his bed. This is the design we will follow at the Garland Community Garden as well. Eric's bed is four feet wide (the standard width for all square foot gardens) and nine feet long. Square foot gardens can vary in width, but all are four feet wide to ensure easy access for the garden. Because of the intense planting configurations associaation with square foot gardening, these raised beds have crop yields up to 50% more than the traditional row planting methods. Eric has used string to delineate his foot squares instead of the traditional wood strips. 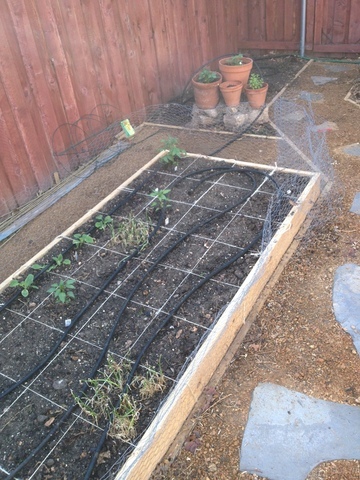 When we install our first square foot garden at the Garland Community Garden, we too will use string. In the second photo I see that Eric has created an easily removable cage of chicken wire over his bed. These cages are used to keep pests and pets out of the garden. Additionally, in the summertime when the noonday sun is too intense, one can put a sheet on top of the cage to protect the plants. Coming Up Green Tomorrow in Garland! Two Big Green Events Tomorrow in Garland! About a mile or two from the Culwell Center, Loving Garland Green, a local nonproft, is holding a huge yard sale. Just drive down Naaman Forest Blvd toward Brand. One block past the second stop light on Naaman School road (at Brand), turn right at the sign on Kingsbridge. From that vantage point you'll see the sale in progress. We would love to see you there! For more detail see our home page at Loving Garland Green. Gardening successfully is a process that one learns over time. Few, if any of us, have enough time to learn all the lessons that gardening has to teach--and even if we did have enough time, there are always those uncontrollable variables such as the weather. (That's where the humility lessons are provided.) However, lucky for us gardeners, some of the variables can be controlled with a little bit of planning. We must be satisfied with applying our energies to these areas. EXTENDING THE HARVEST FOR BLUEBERRIES AND MORE. . .
1. FACTS: There are many varieties of blueberries and according to the variety, blueberry bushes ripen at different times of the year--from April through September. Conclusion: By diversifying the varieties, it will be possible to have blueberries from April through September. 2. FACT: Not all blueberries are self-pollinating. 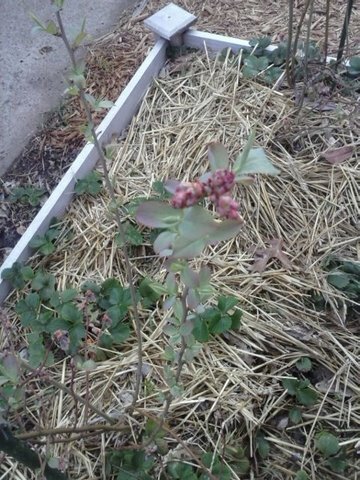 I did not realize this last year when I planted about 20 blueberry bushes in my garden--all of which are Premier. Fortunately for me, the Premier variety is self-pollinating. Had I chosen the Tifblue variety, then I would not be having blueberries this year because the Tifblue bushes are not self-pollinating. Conclusion: If not certain as to whether your blueberry is self-pollinating or not, plant at least two different varieties of bushes. 3. 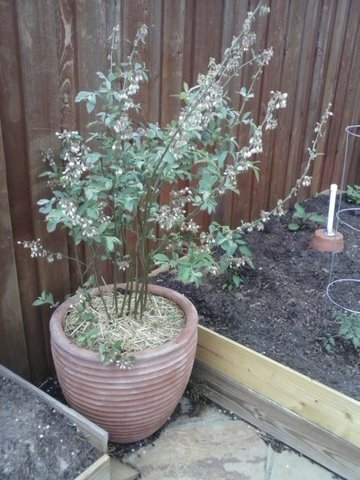 FACTS: You can grow blueberries in large pots. If you build a shelf for the pots (using two by fours and concrete blocks--similar to the outdoor plant shelves at Home Depot) you can grow many blueberry bushes in a small space. Mulch heavily to keep the top of the roots cool and moist. If you plant different varieties, you can have blueberries April through September. Conclusion: You don't need a large space to grow blueberries. In fact, they are great container plants that will grow easily on a sunny patio. Very early with light blue fruit. Ripens in mid-June early July. The Premier is self-pollinating. Ripens Late June through mid-July. Note: this plant is not self-pollinating so you will have to plant another variety too. Ripens mid July through August. Matures very in late September. Sky blue colored berries. My potatoes are on the way! The photo above was taken at Garland Urban Garden Location: 216 East Kingsbridge Drive March 27. The traditional ideal time for planting potatoes in most parts of the country is around February 22, President's Day. I planted my potatoes about 10 days earlier, around February 11 this year, to give them a head start on the heat. Who will win? the potatoes or the heat? Here in North Texas, I think a little closer to the first of February is better for most years. About four weeks later they will start to peek through the soil as shown above. When these sprouts are about six inches high, I'll cover them in loose soil up to underneath their leaves. Then a few weeks later I'll repeat that process. I'll continue to do this until the plant blooms. At that time, some of the potatoes near the bottom will be ready to harvest. In our neck of the woods it's always a race to see who wins--the gardener and the potatoes or the Texas heat. Potatoes prefer cool weather. They do not do well in temperatures that climb into the 90s, much less into the triple digits. The timing for planting is tricky for us with our fickle weather as planting should not be earlier than two weeks before the last anticipated freeze of 28 degrees F or less. 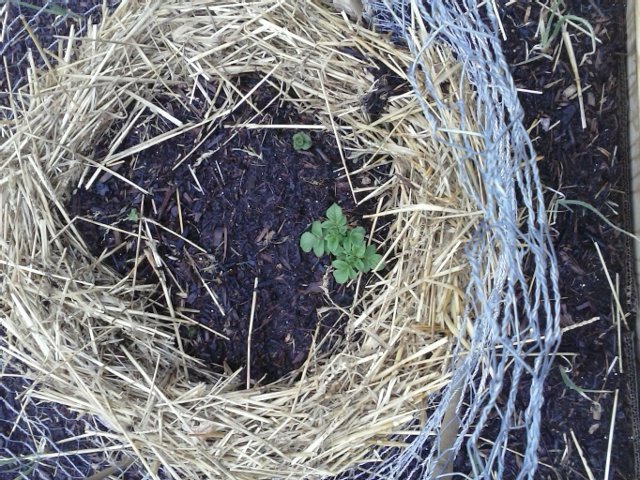 For the REALLY lazy urban farmer: Throw pieces of seed potatoes on the ground and cover with mulch, straw or leaves. I've never done this before, but in late September, when some of my other crops are spent, I'm going to try it this year and see what happens. In addition, I'll throw in some buckwheat seed to grow with the potatoes. The green manure value of the buckwheat, which grows almost instantly like a weed, will help replenish the soil and also nourish the potatoes as buckweat supplies a lot of nitrogen for the soil. See also: Potato Planting Time--Doing it! Checking in with "Another Urban Garden"
Another Urban Garden is a program that is promoted by Loving Garland Green. It is the heart of our operations. We believe in a simple equation: Increase the number of urban gardens within the city limits of Garland (or any city) and the local economy will improve. This happens because the simple existence of gardens growing food and flowers increases the need for new markets and helps to grow existing markets. Organizations such as Loving Garland Green are springing up all over the USA as people rise up and realize the power of urban agriculture to rebuild their community rests literally in their hands. We are hoping that more local businesses will get interested in and help support our efforts--after all, a strong local economy benefits us all. These efforts to raise up urban agriculture are not limited to cities like Paris, New York and Chicago. Local governments of smaller urban areas such as Garland Texas and even smaller towns such as Bryan Texas are getting on the "plant an urban garden" bandwagon with their program, Distributed Urban Farming Initiative. Read more about the power of urban gardens as an economic force in California. If you would like to get on board by participating as a member or sponsor, please call us at 972-571-4497. In the meantime our program, Another Urban Garden, continues to roll along toward building a healthier local economy for our community. In addition to actually building urban gardens, we want to hear from those who are already raising food in our community--whether it's in container gardens, your back yard, front yard or patio. Loving Garland Green would like to register all urban gardens in our community by tne end of 2015 in addition to measuring the impact of these local gardens on our economy as we go. At Ed Browning's home we unloaded enough compost for two raised beds: one 4 feet by 10 feet and the other one about 3 feet by four feet; three 10 gallon clay pots; four smaller clay pots (about 1/2 gallon) and four other small pots (also about 1/2 gallon). [Note: Compost is only part of the equation for soil in which Ed will grow his plants. He will add some garden soil, vermiculite and sphagnum moss to his soil as well as a few ollas for water conservation. As a final touch after planting, Ed will cover the top of the soil with mulch to help slow down evaporation and to protect the roots of his plants. The thing to remember is that soil only needs about 5% organic matter. The rest is made of 45% minerals, 25% water and 25% air. Vermiculite, expanded shale and sphagnum moss help to provide the rest of needed magic to grow healthy plants.] I know, it's difficult sometimes to let go our American thinking of "bigger is better" and "you-can't-have-too-much-of-a-good-thing-like-compost", but perhaps it is time for us to rethink some of our conventional national wisdom. After setting up Ed's beds with soil, we drove over to the Kahl family's home here in Garland. 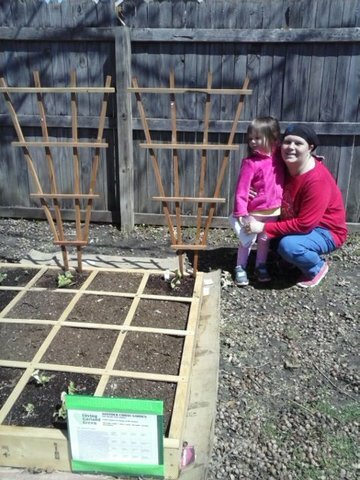 As you may remember, we installed Another Urban Garden--a square foot garden--at their home on March 1. We were assisted in these efforts by the Mayor of Garland, Douglas Athas. Today we took a wire composting cage over to set up for the Kahl familty. Lucky for us, Madilyn Kahl, the most enthusiastic three-year old urban farmer you've ever met, had just raked a large pile of leaves for us. We put them in for the carbon layer and added a generous supply of vegetable scraps that Charlie and I have been saving for about a week, then placed another layer of leaveas on top of the vegetable scraps and concluded the installation by watering the contents of the wire cage thoroughly. It was encouraging to see that everything we had planted on March 1 was thriving (with the exception of one Kale plant that didn't make it through a hard freeze). Even the asparagus was giving us a nod as well as the potatoes--both of which are part of the Kahl Urban Farm's container garden section. Then at my home we added compost to various neglected spots in my several urban gardens. I could swear that I heard the plants saying "thank you." Wednesday, March 26--Another Urban Garden day. 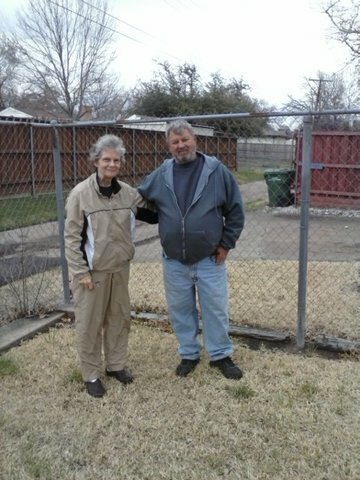 . .
Today we met with Marie Mathis in south Garland to discuss putting in a raised bed in her back yard. The placement area was selected and mapped off for one 10'long -2inch thick -10 inch tall by 4 feet wide bed. In 10 days to two weeks we will be planting beets, squash and other vegetables in Marie's bed. After stopping at Marie's place, we went over to her neighbors home, Sandra Dinkins. Sandra's chain link fence is a perfect home for some blueberry starts I have. I'll bring them when we put in her raised bed. No doubt, later in the spring when we revisit Sandra's garden, the vegetables will be huge as Sandra already demonstrates a large green thumb by virtue of all the beautiful and healthy pansies growing in her front yard. To conclude our day of "Another Urban Garden", we stopped by to see Jean Shortsleeve's garden. Jean is a member of Loving Garland Green. On March 1, one of our board members, Robert Opel installed an urban garden for Jean. To our delight, Jean's kale was thriving largely--much more largely than mine in fact! To date, we have 27 garland urban gardens registered with Loving Garland Green. If you would like to add your garden to the registry, please call Liz at 972-571-4497. We'll come over and explain our program in detail. So you want to make a raised bed. . . Indeed! 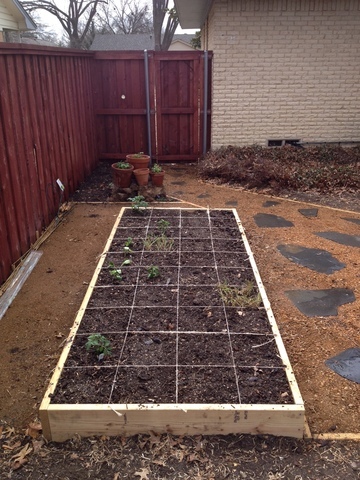 Making a raised bed is the first step to creating an urban garden in the DFW area because not much is going to grow out of the soil here as it is. It's taken me 9 years of failure to finally grasp this concept: Few things will grow in the soil "as is" in this area of the country. It is far too clay impacted. Ideally the raised bed should not be wider than 4 feet in order to allow the gardener to have access all the way around the bed. Otherwise, your imagination is the limit as to how to construct the container for your raised bed. Most of them are square or rectangular in shape, but they don't have to be. For example, there are the keyhole garden structures which area kidney-shaped. For more detail on these structures, see this field guide. 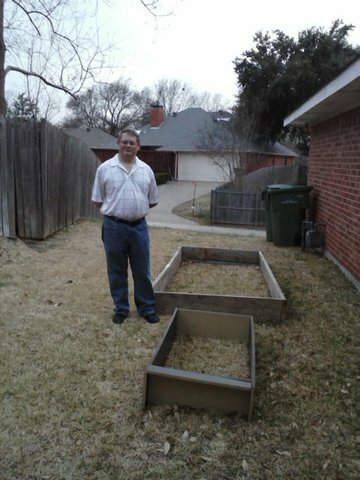 Below is a photo of Ed Browning, a member of Loving Garland Green with two of his raised bed boxes waiting to be filled with soil. The one in the foreground is an old bookcase without the shelves. The one in the background was made from found lumber. Recycle, reuse whenever you can. You will save money and save the environment. I recommend driving around your neighborhood on Mondays and Tuesdays when people set their unwanted items out in front of their homes here in Garland. Within two weeks, I guarantee that you will have found all the items you need to build at least one raised bed frame. 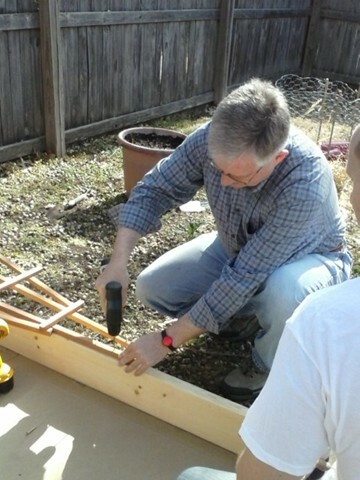 In fact, I literally did make a raised garden bed frame from an old bed frame I found. Amended soil is soil that has been mixed with various ingredients to encourage healthy plant production. The various ingredients and their percentage of the mix consist of will vary according to what urban farmer you ask. Some, like Mel Bartholomew, the founder of the square foot garden method, will tell you the mix is 1/3 vermiculite, 1/3 peat moss, and 1/3 mix of compost and garden soil. Others will instruct you differently. I follow Bartholomew's mix to establish a bed and then add a thin layer of compost to the top of the soil every season. Healthy soil is light and fluffy. Heavy, clay-compacted soil such as we have in the North Texas area does not make for healthy plant roots. The sucess of your garden depends on healthy soil. The more you do to keep your soil healthy, the more productive your garden will be. I like the mixture of 1/3 vermiculite and 1/3 peat moss because this mixture increases the retention of water in the soil while still eliminating the possibility of root rot. All urban gardeners should have some sort of a composting system. Composting is a means of recycling almost any type of organic waste. Classic composting is labor intensive and requires frequent turning--but not so bad if you have a compost tumbler. There are two other methods of composting that are easier: Sheet Composting and Vermicomposting. Apply high nitrogen greens first directly on top of the ground where the microbial populations can feed on them. Cover the green layer with the coaser carbon browns (such as dry leaves). This layer acts as a mulch to prevent the nitrogen green layer from drying out. Use earthworms to convert nutrient dense materials, such as manure and vegetable garbage from your kitchen, into healthy soil for your plants. A local worm expert is located right here in the City of Garland--Heather Rinaldi of the Texas Worm Ranch. 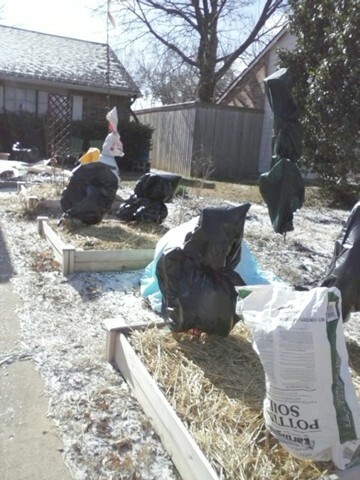 Mulching (covering the top layer of soil) is very important for several reasons--especially in our North Texas area. The soil in raised beds will dry out quickly in our 100 + degrees spring and summers. Covering the top layer of the soil with a mulch, such as straw or pine needles, will slow down evaporation and will also keep the soil and all the microbe community living there healthy and doing their respective jobs for your plants. Sometimes when I'm talking to folks about Loving Garland Green and our mission to increase the number of urban gardens in Garland because it will raise up our local economy by creating new markets and stimulating existing markets, I get the "deer in the headlights" blank stare. Their eyes glaze over and I may as well be telling them that I believe that a Martian invasion is imminent. 1.) Recently I wanted to purchase a wire cage to hold leaves for a compost pile to add to one of our "another urban garden" installations for a resident here in Garland. I looked at Lowes, Home Depot, Roach Feed and Seed, Rhodes, and even Walmart. No wire compost cages were sold at any of these stores. So. . . I went online and ordered one for $40.00. Because of urban gardens, there was/is a market for these wire compost cages which are affordable. Speaking of compost containers. . . you can find other types of compost containers at these garden stores but most of them cost between $100 and $150. My friend Gene Rodgers (the other half of Margie) who lives across the street from me built a tumbing composter himself from a 55 gallon barrel he purchased for $15.00. With the wood for the stand and related hardware, it cost about $25.00. You cannot touch a tumbling composter for less than $100.00. Now if Gene wanted to, he could add on another $25.00 for his labor and sell his models for $50 and make a $25 profit, and that is just one small example of what I mean by "creating new markets." 2) Today, just this morning, I called Roaches Feed and Seed and Rhodes (two of our local garden suppliers/nurseries) to ask if they had any rabbit manure. Roaches had none--missed opportunity for them since I'm lazy and Roaches is closer to me than Rhodes. Turns out Rhodes carries rabbit manure so I'll be heading over there today. Note: I didn't even bother to call Home Depot or Lowes because if I could even get hold of someone to talk with the answer would be no. They carry brand names. As far as I know, there is no branded version of rabbit manure. The point is that the more people who learn the value of urban gardening--particularly organic urban gardening--the more demand you will see for items such as compost containers and rabbit manure. The smarter retailers will get ahead of the curve and start supplying these items. There's just no manure that works as well for the garden as rabbit manure. It's considered a "cold" manure, you don't have to let it age or compost before you use it. Other manures that come from chickens, sheep, horse, cows, and pigs are "hot" manures. They need to be composted for months before you can safely use them or you'll burn your plants. Some gardeners are cautious about pathogens and prefer to toss the rabbit manure into their compost piles. Then there are others who apply the rabbit manure directly to the garden. You can also use the rabbit manure to make rabbit manure tea. Put a handful in a bucket and stir ever once in a while for a few days. Then pour the "tea" at the stem of the plants and toss the remaining pellets into your compost pile. Rabbit manure is a great source of nitrogen for your compost pile and your garden if you are not adverse to applying it directly to the soil there. Two Photos Titled "Hope and Promise of Good Things to Come"
On the left is a photo I took this morning of my Georgia peach tree. It is one of several fruit trees that I've planted on the side of my front yard where I'm in the second year of establishing a woodland garden. This area contains perennials that will come back year after year. In addition to the fruit trees (two peach trees, two pomegranites so far) there are also 20 blueberry bushes, four blackberry vines, and countless strawberries. On the right is an experiment. This bed is located on the other side of my front yard. The box is made from a knotty-pine bed I found that was being tossed. To the left is a potato tower. 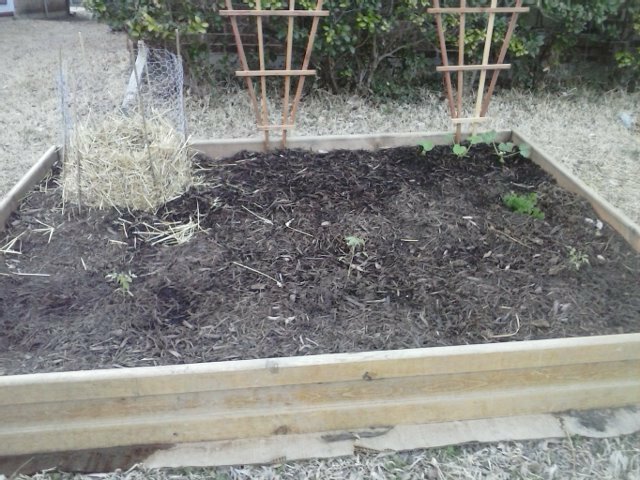 To the right by the trellis are three zuchinni plants. In the foreground, which you can see perhaps if you squint, are three tiny tomato plants that I started from seed. The one in the center is a Flamenco tomato. I ordered the seeds for it from Native Seeds out of Tucson Arizona, The other two tomato plants are from seeds I save from last year. They are for a pear-shaped tomato that grew like a week last year. I planted it in July and it bore tomatoes from August through October. I just got an email this morning from Paul Ragsdale--Ragsdale Farms. I met Paul and his son Zach last summer at the Garland Marketplace on the downtown square. In fact, in August of last year I posted an article about them and the Marketplace Garland. I'm happy to see they are not only still in business, but are thriving. I'm also happy to see that Marketplace Garland is returning too--beginning in April of this year. Zach Ragsdale above with Oleifera trees. Zach Ragsdale is the one who introduced me to the Moringa Oleifera as well as the fact that one can make flour and thus bread from mesquite beans. I fear the Oleifera I purchased last summer from Zach went South from my lack of attention and water, but I plan to purchase a new one from him in April. 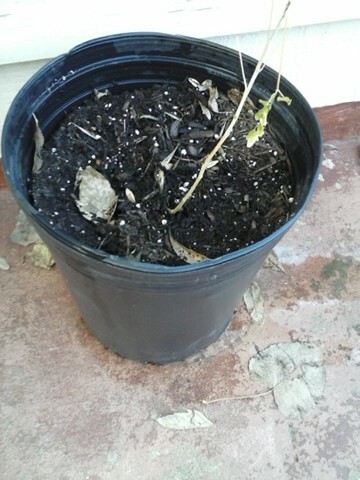 However, the bottom of its stem (trunk) is still green so I watered it this morning in hopes and will keep you posted. The Moringa Oleifera is a small, shrub or tree that can reach 12m (36 ft) in height at maturity and can live for up to 20 years. Every part of the Moringa Oleifera tree–from the roots to the leaves has beneficial properties that can serve humanity. In many countries Morgina Oleifera is used as a micronutrient powder to treat diseases. According to the literature, the Moringa is a shrub or tree that can reach 36 feet in height at maturity and can live for up to 20 years. Like bamboo and hemp, Moringa is among the fast-growing trees as it can reach 9 feet in just 10 months. 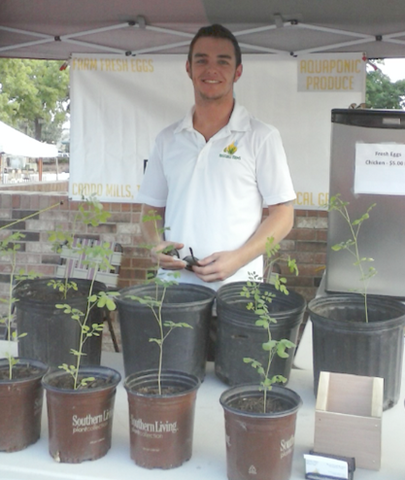 The Moringa has deep roots and can survive drought conditions well. Moringa is an important food source in some parts of the world. Because it can be grown cheaply and easily, and the leaves retain lots of vitamins and minerals when dried, moringa is used in India and Africa in feeding programs to fight malnutrition. The immature green pods are prepared similarly to green beans, while the seeds are removed from more mature pods and cooked like peas or roasted like nuts. The leaves are cooked and used like spinach, and they are also dried and powdered for use as a condiment. The Ragsdales must have been busy over the winter! I see they are providing all-natural aquaponic produce and also constructing aquaponic systems from 35 or 55 gallon barrels that can easily fit in your home so you may conveniently grow your own produce. No doubt they will be demonstrating some of their models at Marketplace Garland. And don't forget their eggs! They offer both chicken and duck eggs. Of course their birds are free-range critters. In fact they are treated by the Ragsdales as pets. If you want to know anything about chickens, just ask Paul Ragsdale and he will tell you. What's the difference between eggs purchased in a chain store and eggs purchased locally? It's a world of difference. Store bought chicken eggs are 30 days old on average when purchased. That should be enough information right there. If you care to try, here is my recipe for mesquite bean bread. By the way, the Ragsdales sell mesquite beans at their booth. Be sure to stop by their booth on April 19 in Garland and meet them. You won't regret it, I promise. I'm hoping to get out to their farm some time in the next month. Step 1: Mix dry ingredients in a bowl. Step 2: Add water and mix. Step 3: Stir with fork (mix will be sticky). Step 4: Cover in a bowl, let sit overnight. Step 5: Place bread dough on cutting board covered with towel for 2 hours. Step 6: Put in bowl and bake @ 350 for 1 hour. After the initial installation that is. . . The one drawback to these new methods of gardening is sometimes the expense if you cannot find reusable materials and the fact that building and setting them up can be time and labor intensive. However, the good news is that once the garden (usually some form of a raised bed) is set up, there is no more back-breaking work of hoeing or tilling the soil each season as one expects to do with traditional gardens. Also because most of these new methods of gardening break all the cardinal rules of proper plant spacing, there are few, if any, weeds to pull. I recently posted a story about the square foot garden that members of Loving Garland Green installed here in Garland last week. The square foot garden, a method developed by Mel Bartholomew in the 1980s, is another example of raised bed gardens that takes advantage of every square inch of soil. This afternoon I just read an article in "Texas Gardener" about Keyhole Gardens by Suzanne Larry. Nancy Lovett, a fellow gardener here in Garland told me about Keyhole gardens just about a week ago so I was interested to learn more about them. A keyhole garden is a raised bed that is self-feeding and mostly self moisturizing and operates as an all in one gardening, comosting and recycling system. If you can imagine a pie with a wedge-shaped piece cut out of it, you visualize a Keyhole garden. It measures about six feet in diameter and stands about waist high. 1. Measure a six foot diameter circle for the inside wall of your garden. 2. Cut a wedge out of the circle as cutting a pie so you can access the center. 3. Build the exterior wall about three feet high using rocks, metal, wood (anything that can support the dirt). 4. Use wire mesh to create a tube about four feet high and one foot in diameter. 5. Line the walls with cardboard and fill the garden area with compostable materials. Wet the materials as you add them. 6. Fill the last few inches with compost or garden soil. The soil should slope from a high point at the top of the center basket downward to the walls. 7. Fill the center basket with compostable materials, kitchen scraps, herbaceous weeds, etc. that can provide plants with nutrients. 8. Feed the garden by adding more kitchen scraps to the center basket. Water the center basket only when plants won't survive without it. This article is filled with photos. Many of the Keyhole Gardens featured in this article are made from corrugated metal painted bright colors. There are other examples of gardens build from stone. Yes, in addition to several square foot gardens, we will also feature at least one keyhole garden at the Garland Community Garden. And I know just the guy to ask to help us build it--our mayor! Here he is last week helping us put together a square foot garden. This is what "local" looks like at my place this morning. If you went over to Charlies, you would see three large pots with blueberry bushes sitting in his family room. Likely there are similar urban garden scenes all over the metroplex. I was thinking this morning as I updated the website for Loving Garland Green that perhaps not everyone yet understands all the implications (for their own well-being in particular) of supporting local. With over 80 percent of the American population living in metropolitan centers, urban farming has the ability to dramatically enhance economic growth, increase food quality, and build healthier communities. We in Garland are lucky to have a mayor who understands the value of urban gardens. Economic benefits realized through urban farming are local and keep dollars circulating through the community. Urban farms also have a great return on investment, with every $1 invested in a community garden generating $6 worth of vegetables. We are all so busy that many of us don't even realize the consequences of our choices as consumers (although I do think we are improving). For example, while it's true that most of the dollars spent at a chain retail store do leave your commuity within 24 hours of your purchase, did you know that it matters where the retain chain store is located? For example, if I purchase goods subject to Texas sales tax in Garland, where I live, then 2% of that tax will go to support my municipality. However, if I go to a grocery chain store located in Sachse, for example, the city of Garland does not receive a cent of any money that I spend in that store. It will go to support the city of Sachse. And speaking of our sales tax, I don't know how it works for other cities in the DFW area, but here in Garland, 1% of the 2% of the Texas sales tax that we get on taxable purchases made in our community goes to DART. I don't know about you, but as for me, I'm fed up with many of these quasi government/private enterprise "partnerships." It seems to me the ledgers on these "partnerships" are divided so that the taxpapers pay all the expenses (anything on the debit side of the ledger) while the private owners and their investors reap all the benefits on the profit side. We get the debit side and they get the credit side. Maybe there is something I'm missing here in this agreement my city has with DART, but it seems to me in a partnership the taxpayers should be getting some of the rewards in terms of the profit that is being made. It's one thing to give a hand up to folks in need, but our welfare for the wealthy needs to end. Of course the argument is that the people of Garland have public transportation--but really, folks, what is the true cost to the taxpayers for this deal? What does that ledger really look like? I rather suspect that it is heavily tipped toward the private owners and their investors. How much is DART really making off the people of Garland and other municipalities in our area?